So my keys are locked in my trunk with the groceries and no way to get them out. I was very thankful that I had not put the kids in the car yet, because it was hot. I’m also very thankful for a mother-in-law who came to rescue me with the spare set of keys. And there was a Starbucks next door, so while we waited we enjoyed an iced chai, a cookie and chocolate milk. At least it turned out to be a fun morning. And you can be sure I will keep the keys on my person from here on out. 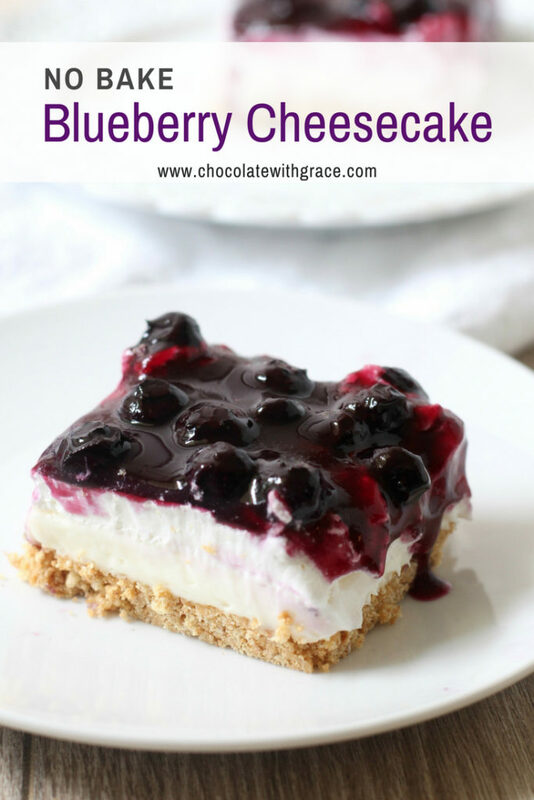 This is the last of the three recipes I shared this week that use blueberries. 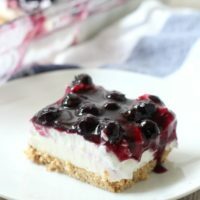 You can check out the blueberry pie filling and blueberry pie bars as well. 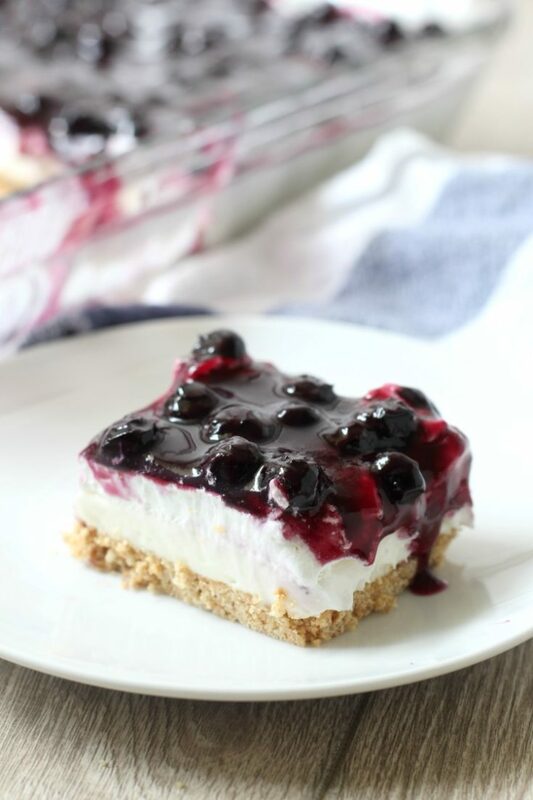 This recipe uses that blueberry pie filling on top. Have you every had the classic cherry cheese dessert. This is the blueberry version of that. 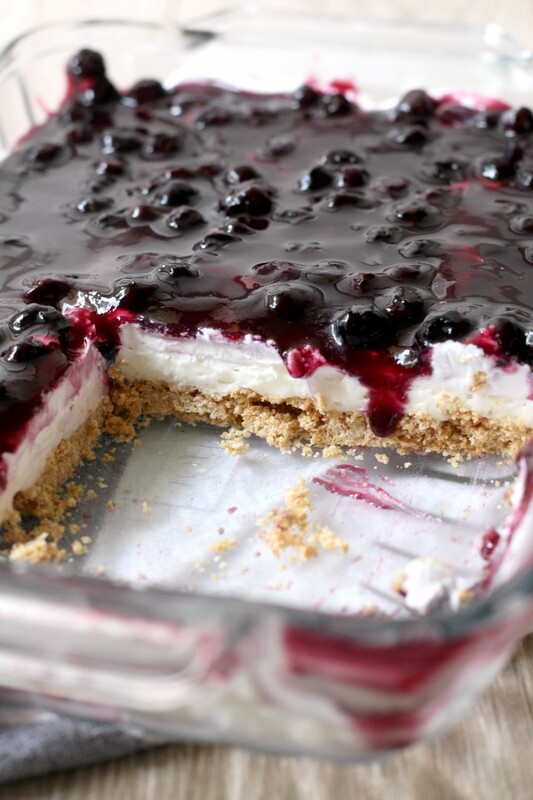 It has a graham cracker crust, no bake cheesecake filling and blueberry pie filling on top. Blueberry was the version my family liked the best growing up. 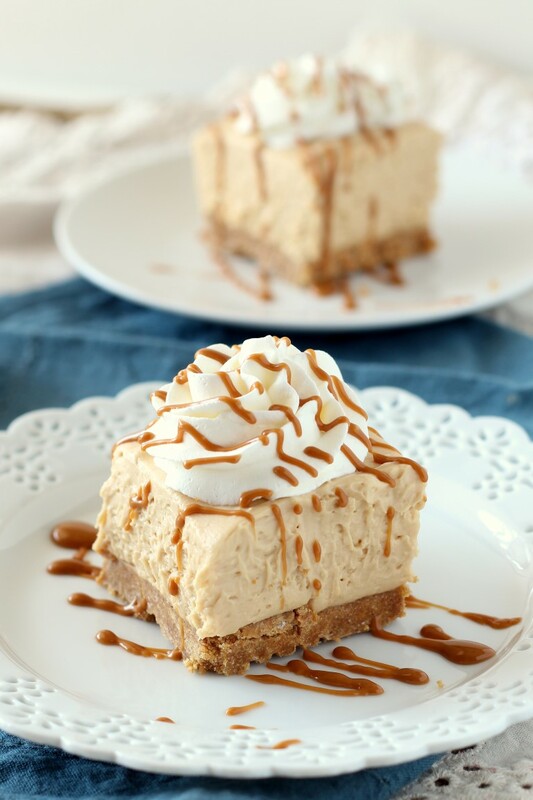 The original version call for baking the graham cracker crust. I tweaked the recipe a bit, by adding a bit more butter to the crust so we can skip the baking step and the crust will still hold together. If you prefer a baked crust, go ahead and bake it for for 10 mins at 325 F.
Because of the unbaked crust, you will also need to make sure it chills for at least 6 hours or otherwise the crust may fall apart. And one last tip on the crust, be sure to finely crush the graham crackers. Use a food processor of blender if you need to. The finer they are, the better the crust will hold together. Stir together the melted butter, graham cracker crumbs, and sugar. Press into the bottom of a 9 x 13 baking dish. In a large bowl, beat together the powdered sugar, cream cheese, milk and vanilla until smooth. Carefully spread on top of the crust, being careful not to break it. Top with the whipped topping or homemade whipped cream. Carefully spread on the blueberry pie filling. Chill for at least 6 hours before serving. Store in the refrigerator. Best eaten within a few days. 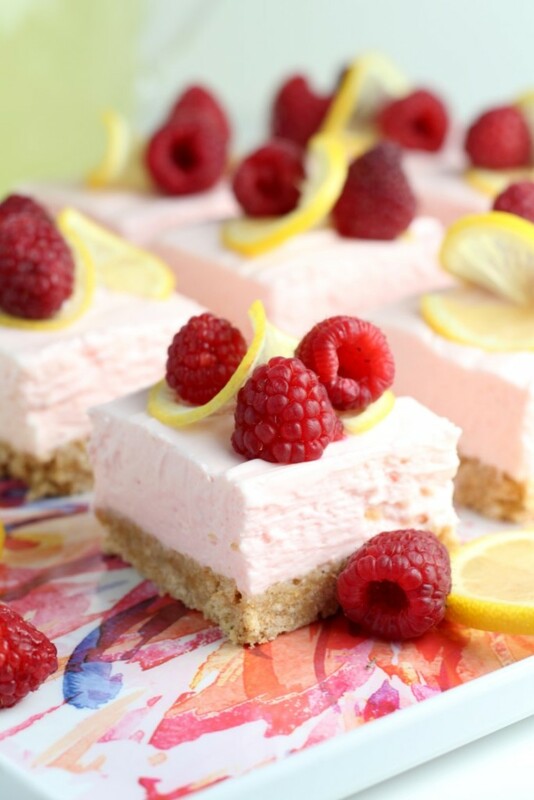 No Bake Cheesecakes are easy and fun, try these other versions. Can i use commercial whipped cream as well? What milk did u use? Whole Milk. But 2% Would work too. I would try homemade whipped cream first. 1 and 1/2 cups of heavy cream equals 1 (8 oz) tub of cool whip. Just whip it up with 2-4 tablespoons of powdered sugar until stiff peaks form.